First, the church has a huge obligation to call, equip, and release students to SERVE God. Student ministries and the church at large must begin by calling students to SERVE God. Salvation does not begin and end with a free ticket into heaven. And it goes further than growing as disciples. It extends to the point of actively living as servants of God. The church must courageously set this expectation (from God) right in front of students’ noses! As Samuel instructed Israel we too must “Obey the Lord and serve Him faithfully with all your heart.” (1 Samuel 12:24) Next, the church must equip students to SERVE God. Equipping comes through Bible centered teaching and preaching, testimonies given from experience, opportunities for students to discover and understand spiritual gifts, and “laboratory-type” opportunities through which students can try and even error and SERVING God through ministry AND missions. Finally, the church must release students to SERVE God. Simply put, students are placed into both formal and informal roles of ministry provided the opportunity to be on-mission locally, regionally, and world-wide (see Acts 1:8). Note: missions is both corporate (accomplished through teams) AND individual (everyone is a missionary to the immediate context they live and exist in). Second, families have a huge obligation to raise up servants of Jesus Christ. The church is not the sole proprietor of making servants of God; SERVING must be expected, modeled, and intentionally accomplished within individual families. Has your family ever provided an act of service or ministry together? Gone on a mission trip together? Shared the gospel with the next door neighbor together? Before the church corporately gathers students together as ministers and missionaries, releasing them for service, families must first be calling, equipping, and releasing their students to SERVE to the best of their ability. There is no template for SERVING God that all must adapt to; simply get out there and meet a need with the love of Christ for a fellow believer (ministry) and convey the gospel message of salvation to the lost (missions). Quite frankly, this level of SERVING God is the most avoided by families, individual Christians, and even churches. Why? Because it requires pro-activity, courage, time, passion and compassion for people, and consistency. But just as CONNECTING and FOLLOWING are purposes of God, so too is SERVING. As you serve, both as families and churches, understand the difference between ministry and missions while knowing that God calls you and I to both. There is a first level on which families and churches must partner together in fulfilling their roles in being used of God to lead children and students to become fully devoted followers of Jesus Christ. That level is one in which each party places themselves in the hands of God to be used to CONNECT students to God through salvation. Ultimately, a child or students’ response to the love and offered salvation of Jesus Christ is out of the hands of both parents and pastors. However, each can cooperate together and be positioned in such a way for God to use them as vessels through which He reaches into the lives of children and students. This first level of cooperation is derived from The Great Commission where Jesus says, “Therefore go…” (Matthew 28:19). Jesus goes on to say, “…Go and make disciples of all nations,” but for the family and pastor there is no more urgent place to “go” than to the children and students they guard and lead. It is God’s most definite will that your child or student be saved: “…God our Savior, who wants everyone to be saved and to come to the knowledge of truth.” (2 Timothy 2:3b-4) Though God calls His followers to go to Jerusalem (home), Judea (surrounding area), and all the way to the ends of the earth to make disciples (Acts 1:8), I am confident that His desire would be for us to begin with the children and students that we are most directly connected to. In light of God’s design, the question we must ask is “how do we make disciples of our children and students?” Forthrightly this means that we lead them to trust in Jesus Christ for salvation. The first step to being a disciple of God is salvation. Immediately, a second question comes to mind: “how do we lead our children and students to trust in Jesus Christ for salvation?” The answer to that question comes in the form of God’s designed cooperation—that families and the church work together to CONNECT students to God through salvation. As we came to understand in the introduction to this series called “Designed Cooperation,” the Shema places families, particularly parents and guardians, as the primary spiritual influencers (or disciplers) of their children and students. As such, it is the role of parents to “live the gospel” toward their children and students. The Gospel is the good news that despite our sin problem, Jesus Christ has done everything necessary to provide a way for separated human beings to have a personal and eternally saving relationship with God through Jesus Christ. Thus, “living the gospel” requires that parents and guardians pour grace, mercy, instruction and direction, discipline, nurture, time and affection, patience, and friendship into the lives of their children and students. These are the very characteristics that God Himself pours into our lives. Why this necessity? Because how you lead, treat, and engage your children and students is a reflection of your heavenly father. “Living the gospel” can urge your children and students towards the Savior. Consequently, failing to “live the gospel” can detour them away from the Savior. Ultimately, families must also have a firm grasp and clear means for sharing the truth of the gospel with their children and students and directing them to trust in Him for salvation. The church cooperates with families in this task of “living the gospel.” The church must preach the plain and un-distorted truth of the gospel in a way that is understandable and transferable (that is, families can continually convey the same message). Additionally, the church should regularly provide opportunities for children and students to respond to the truth of the gospel. Finally, the church must provide a guidance and instruction by which new Christians can be rooted and built up into fully committed followers (disciples) of Jesus Christ (more on this when we talk about FOLLOWING God as disciples). And so on this first level of CONNECTING children and students to God through salvation, families and the church are designed to cooperate together. The church cannot be held fully responsible to minster the gospel into children and students’ lives while the family sits back and does nothing to “live the gospel.” And families cannot be held fully responsible to minister the gospel into children and students lives while the church does nothing to consistently present and affirm the message of the gospel. Again, both families and the church are designed to work together to CONNECT children and students to God through salvation. By design God intends that families and churches cooperate in rising up the next generation of fully committed followers of Jesus Christ. It is a mistaken assumption that either families or the church are solely responsible for and distinct from one another in the development of making disciples. 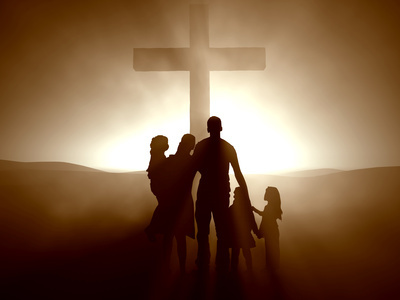 God’s plan as revealed in Scripture is that families would be the primary disciplers of their children and teenagers while the church extends and complements the disciple-making ministry. Deuteronomy 6:4—9, a passage known as “The Shema,” is a summary confession of the Christian faith by which God’s people acknowledge the One True God and His designed plan for our lives. The passage reveals a pattern that helps God’s people relate His plan and His Word into our daily lives. According to The Shema, Christians are to love God, think constantly about His commandments, teach His commandments to our children, and live each day by the guidelines of His Word. The passage pointedly emphasizes the importance of parent’s teaching the Bible to their children. It is important to note that God revealed this designed plan for the families’ spiritual leadership in the lives of their children before He revealed His designed plan for the church’s spiritual leadership in the lives of people. Though there is not a single verse that defines the purpose of the church, the New Testament is full of descriptive responsibilities given the church. The church is to worship God (Luke 4:8, John 4:23), study His Word (2 Timothy 2:5), pray (Acts 2:42), love one another (John 13:35), partake of baptism and the Lord’s Supper (Mark 16:165, Luke 22:19-20), learn how to live as godly people (Titus 2:11-12), and be equipped and sent out to evangelize the world (Matthew 28:18-20, Ephesians 4:12). Acts 2:42 provides a solid summary of what ought to take place when believers gather together in Christian community: And they devoted themselves to the apostles’ teaching, to the fellowship, to the breaking of bread, and to the prayers. (Acts 2:42). All churches should model themselves after this verse. Furthermore, God has given the church pastors so that the body of believers gathered would be trained in the work of ministry and built up as the body of Christ (Ephesians 4:12). Unfortunately, God’s designed plan has been lost in translation over the past two millenniums. A striking conclusion must be drawn: on the grounds of making disciples, the family begins the process while the church complements the ministry that is already taking place within the family. God has never intended for the church to be the primary or sole spiritual influence in a child or teenagers life. When the family shrugs their responsibility and relies solely on the church to make “good Christians” of their children or teenagers, they deny God’s designed purpose and the whole process breaks down. This striking conclusion is derived from Scripture but is also apparent on a pragmatic level: families live, sleep, and eat with children and teenagers for seven days a week, while the church has them for only a couple of hours each week. Clearly, based on God’s design and revealed will, families and churches must cooperate in rising up adolescent and teenage disciples of God. The church at large is doing well to identify God’s design for cooperation between families and churches, but rarely does this identification morph into practical guidance and instruction on how this is to practically play out. That is why this student pastor desires to take this issue head-on over the next few weeks, laying out a plan with practical steps as to how families can work together with their church in fulfilling their roles and purposes in being used of God to lead children and students to become fully devoted followers of Jesus Christ. 41 So those who accepted his message were baptized, and that day about 3,000 people were added to them. 42 And they devoted themselves to the apostles’ teaching, to the fellowship, to the breaking of bread, and to the prayers. On the day of Pentecost many people trusted Jesus Christ for salvation and were immediately baptized. It is important to note that baptism was an immediate and first act of obedience of brand new Christians who had trusted Jesus Christ as the Lord of their lives. Baptism acted as a visible testimony of salvation and marking grounds for bringing believers into a common bond and fellowship with one another. Upon salvation and baptism these believers united with one another in a bond of common purpose and devotion to Christ. This was manifested through joining together for teaching, the breaking of break, and prayer. This group of believers had a fear of the God who was working miraculously among them. They met the physical needs of one another. They continually met together and praised God joyfully together. And they must have proclaimed the gospel, for every day the Lord added to them those who were being saved. Fellowship is more than potlucks and get-togethers. In youth ministry it is more than meals, open gyms, lock-ins, and hangout time. Though each of these can be avenues through which fellowship takes place, they are not the substance of fellowship. Rather, fellowship in youth ministry is when Christian students unite together in the common bond of Christ Jesus. In the church I serve we call our Senior High weekly worship service, “Converge,” which means, “to come together from different directions.” That is, many students come together, despite their differences and from different places, and become one in the common bond of Christ. Fellowship in youth ministry is uniting students together for the purposes of God and in devotion to Him. This requires intentionality. It requires making sure that programs, events, and activities are more than hollow time together. It requires learning together, worshipping together, praying together, communion together through meals, and doing life together—even outside the walls of the church. There is no single template that fits every church; fellowship will look significantly different in youth ministry settings of all shapes and sizes. But the intent of fellowship is certain—to rally together in the name of Jesus Christ, for His purposes and in devotion to Him. “Youth Ministry—What’s the Point? 4 (Fellowship)” is part 4 of forthcoming seven part series written by John Howard, Minister to Students at First Baptist Church, O’Fallon Illinois.